T8 has its own R&D Center which is a resident of the Skolkovo innovation center. T8 has its own R&D Center (“Scientific and Technical Center T8”) which is a resident of the Skolkovo innovation center. 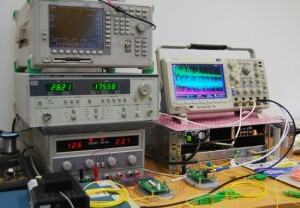 Scientific department of STC T8 researches data transmission in fiber optic networks. The head of the scientific department is Oleg Nanii, doctor of physics and mathematical sciences and professor of the M.V. Lomonosov Moscow State University. • publication of scientific results in leading international and Russian journals. Also the scientific department performs scientific, research and development projects for external Customers. We have a profound experience in development of devices for various tasks in the field of optical physics. Our measurement laboratory is equipped with the state-of-the-art tools and is the largest in Russia. More than 200 devices are available for performing experiments and researches of optical effects. Since 2012 year the STC T8 is a resident of the Skolkovo innovation center. Our team has successfully developed high-speed DWDM platform with a total capacity of 25 Tbit/s. The 40 mln. roubles (over $0,5 mln) was granted by the Skolkovo Fund to this project. STC T8 has presented the prototype of the 25T system at “Svyaz-Expocomm’2013” exhibition; the commercially available equipment was ready in the end of 2015. The technical solution is based on using 250 data channels with a speed of 100G each (DP-QPSK modulation). Superchannels 10x100G are organized to improve the management of the platform. (More details about 25T DWDM-platform). One of promising fields of our researches is the development of DWDM-platform with a total capacity of 40 Tbit/s per one fiber. In order to achieve this goal we actively investigate Nyquist WDM technology as well as technical solutions for transmission of up to 400 channels in 25 GHz grid. The STC T8 develops its own 100G optical module based on discreet elements that will be “the heart” of our next-gen DWDM system. Usage of Russian-made 100G module instead of foreign analogues is an important step towards further development of the Russian optical telecommunication systems. We are also working on development of OTN cross-connect matrix with a capacity of 1 Tbit/s. The STC T8 has presented the prototype of such system at “Svyaz-Expocomm’2014” exhibition, and we are planning to produce the commercially available equipment in the end of 2016. Transponders and muxponders with OTN cross-connect matrix with a capacity of 40 Gbit/s are already available for our Customers. These modules can manage data flows in the optical line as a part of standard DWDM platform “Volga”. We pay special attention to research and development in the field of long-haul data transmission. Large spaces of the Russian Federation lead to a specific requirement to telecommunication equipment: it must be able to transmit signal over large distances without using power supply in intermediate points. Such systems are necessary for building backbone networks in little-developed territories as well as for submarine DWDM networks. Our team actively researches and develops various amplification technologies for the fiber optic telecommunication systems, including ROPA (Remote Optically Pumped Amplifiers), Raman amplifiers and different hybrid schemes. In 2015 we have successfully transmitted 100G channel in a 4250 km fiber optic line “Moscow-Novosibirsk” without 3R regeneration. The channel was transmitted in DWDM-system based on foreign equipment (“alien wavelength”). Several world records in data transmission were set using our equipment and technologies developed in the scientific department. (More details about our world records). The scientific department not only develops new equipment and advanced systems but also continuously improves the existing equipment in order to increase the quality of its operation. For example, we thoroughly analyze simultaneous transmission of 100G and 10G channels in different configurations to achieve most stable operation of DWDM system and offer typical solutions for the Customers. The results of such researches are used successfully in real projects. Our experts visit customer sites to solve non-standard problems and conduct test runs of high-speed channels. As one of results of research and development in the field of fiber optic sensors, the “Dunay” system was created. It is a distributed fiber optic sensor of acoustical influences. “Dunay” is based on using coherent OTDR (COTDR) that can register even subtle vibrations caused by the movement of a pedestrian. Our specialists regularly participate in scientific conferences and publish articles in leading international and Russian scientific journals. Articles of our specialists are available on our web-site in the “Publications” section.